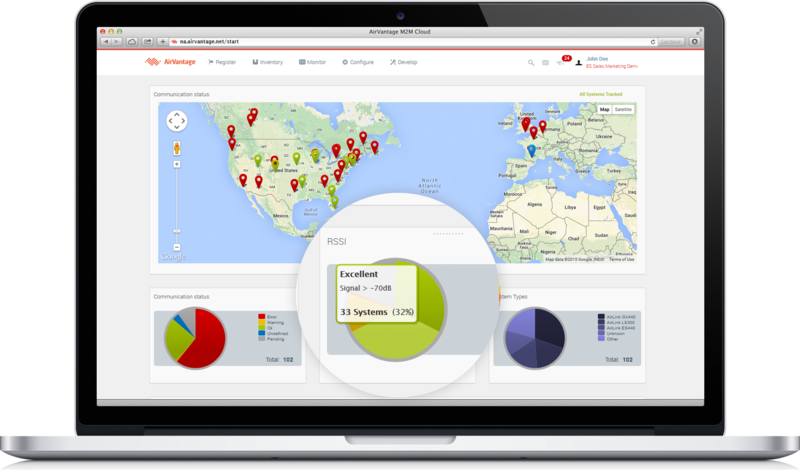 Monitor helps you manage your fleet of systems deployed on the field. It provides access to all the systems of the company along with their status, communication history, configuration and management. All the functionalities provided by AirVantage may not be available on all the devices. The Dashboard is user configurable so you can get a quick look at the information that is most important. Online status, alerts or cellular network related information for example. The widgets are interactive so by clicking on a pie chart segment you will be taken directly to a list of those devices. Includes a map showing the location of devices reporting GPS or configured to show fixed location via user input. 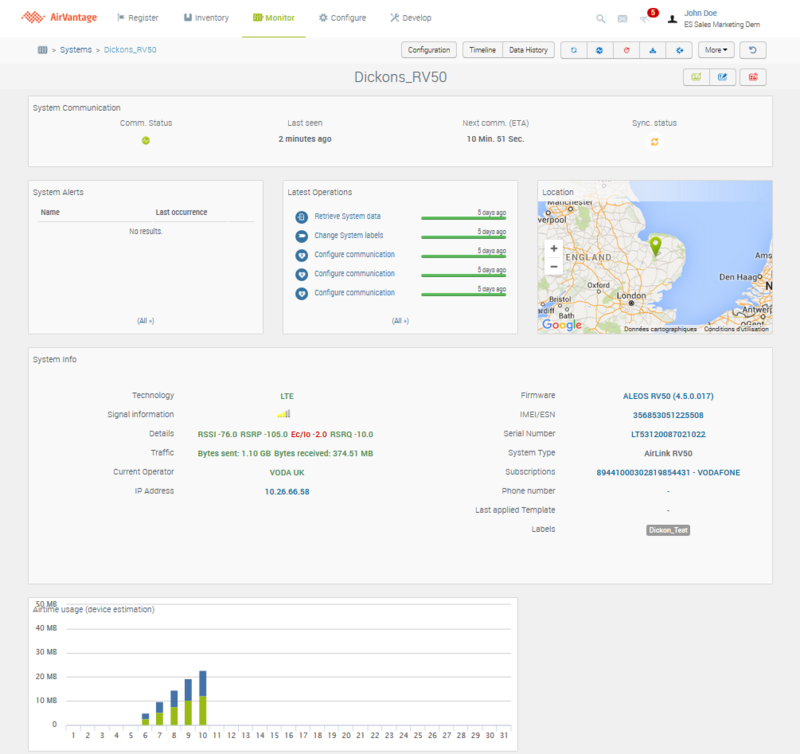 Widgets can be configured to plot evolution of collected data, providing additional analytical capability for your fleet. 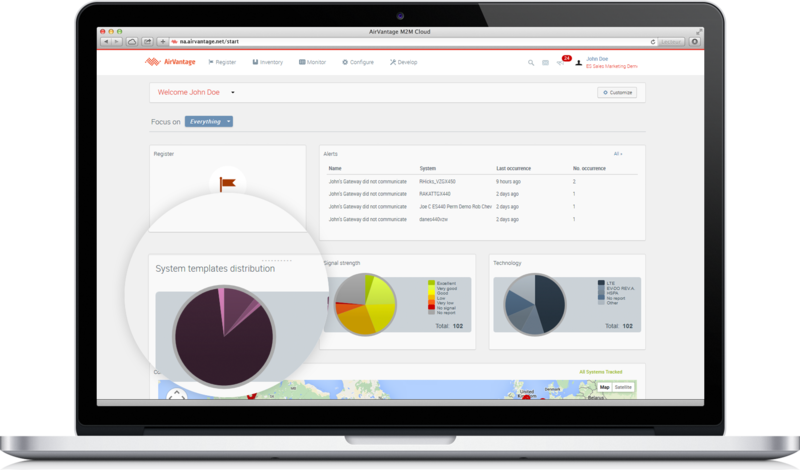 Any numeric data can be visualized for checking the fleet trend. e.g. See the mean max and min values for the power input voltage of my fleet of devices. See here for more information about dashboard. The Systems section. It provides access to all systems along with their status, communications history, configuration and management. 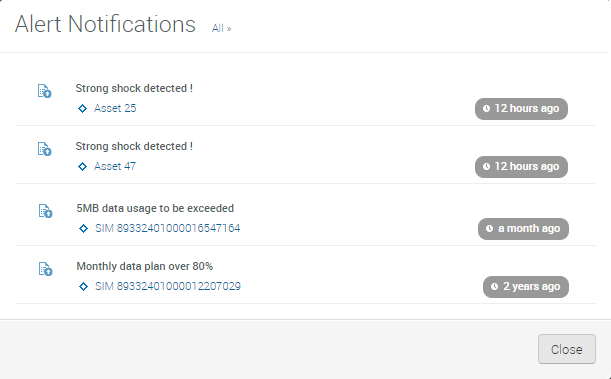 The Alerts section shows all the alerts currently raised for your devices. The Systems section shows all the systems READY and DEPLOYED in your company along with the device management data. You can find the description of the systems states in the Inventory section. Finding a device or group of devices of interest is easy using filters. These can be applied for single or multiple variables: filter on gateway type + firmware version. Labels gives a powerful way to add flexibility in identifying devices. They can be used for geographic regions, vehicle types, host device types, application groups, or any other identifier that you would like to apply and use as a search term in the future. Devices can have an unlimited number of labels. Or directly used to perform one of the device management operation. Export Data Export in a .csv file a copy of the latest data stored in AirVantage for multiple systems or to export in a .csv file the history of data stored in AirVantage for a given system and a period of time. Synchronize Create an operation to Synchronize AirVantage with your systems. Configure Communication Change the frequency your systems are communicating with AirVantage, and also define reports and frequency of these reports. Reboot Reboot one or multiple systems. Upgrade Firmware Upgrade one or multiple systems with a new firmware. Apply Template Change the configuration of one or multiple systems applying a predefined template. Retrieve Data Retrieve on-demand some data from one or multiple systems using a predefined dataset. Custom command Send a command to a system. Commands must be defined in one of the applications running in your system. Send SMS Send a text SMS to one or multiple systems. A SMS gateway needs to be configured in your company. See How to configure an SMS account? for help. Wake Up Send a wake-up message to your systems to trigger a communication with AirVantage. A SMS gateway needs to be configured in your company. See “How to configure an SMS account?” for help. The operation needs to be supported in the firmware of your device. Factory Reset Reset to factory default one or multiple systems. The operation needs to be supported in the firmware of your device. Install Application Install or upgrade an embedded application on your systems. Depending on the capabilities of your firmware/application, only a part of all the operations listed above may be available. You can switch to see your systems and status on the map from the system grid, and toggle from one to another. In map view, you can still use the filters to drill down to a subset of your systems, the same way it can be done on grid view. By clicking on one specific system map marker icon, you will get details about this system and also direct link to launch a subset of operations on this system. The number of unlocated systems is reminded on the bottom of the map. Most recent activity from the device is available from the system details screen. This page provides access into the device communications history as well as device configuration, direct access to AceManager by clicking on the IP address and other functions. check Device View page for details. The details of a given system are accessed from the Systems list view clicking on the Details icon in the actions toolbar after selecting a system or directly in actions column of the system. Sierra Wireless team is pushing new firmware packages on AirVantage so you can keep your fleet up to date with the latest features and security patches. 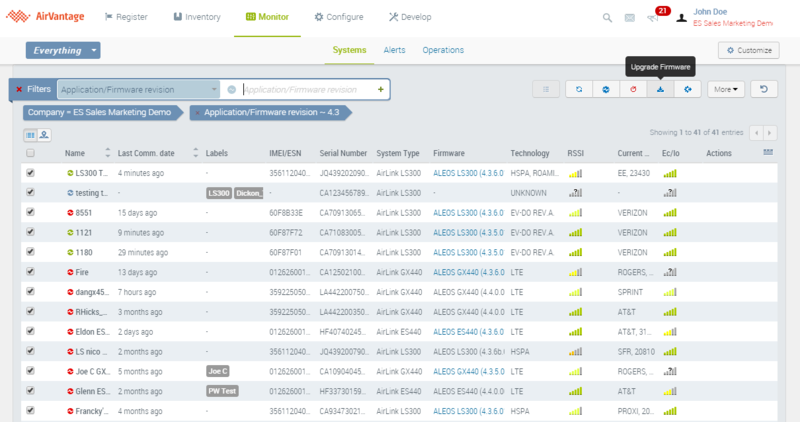 AirVantage also provides different widgets showing which firmware versions are actually deployed on your systems and the upgrade status compared to latest released firmware. 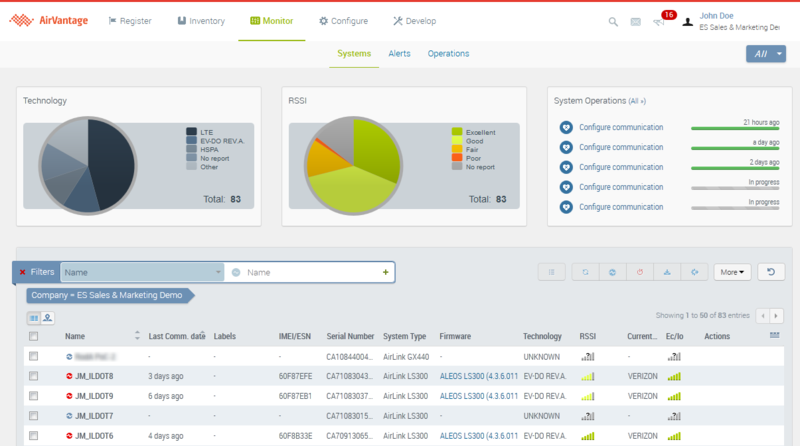 The Upgrade Status widget on the Start Page Dashboard identifies systems in need of firmware upgrades, and lets you apply the latest build to all systems of a device type with a single click. Where all devices of a given type are already up to date, a green status icon is shown on the widget. If some or all devices of a given type need updating, an amber or red status is shown. Upgrade or install an embedded application on one or multiple devices. Embedded applications descriptors and update packages can be uploaded in AirVantage (see the Develop activity to release and publish a new application.) and as a consequence can be used to install the application or update an existing one on the compatible systems. Select the systems to upgrade from the list, click on Install application and choose the application to install. AirVantage will create an operation and execute the application installation over the air when the system will communicate. Monitor the progress, the status of the operation. In case of failure, apply retry without redoing the setup. 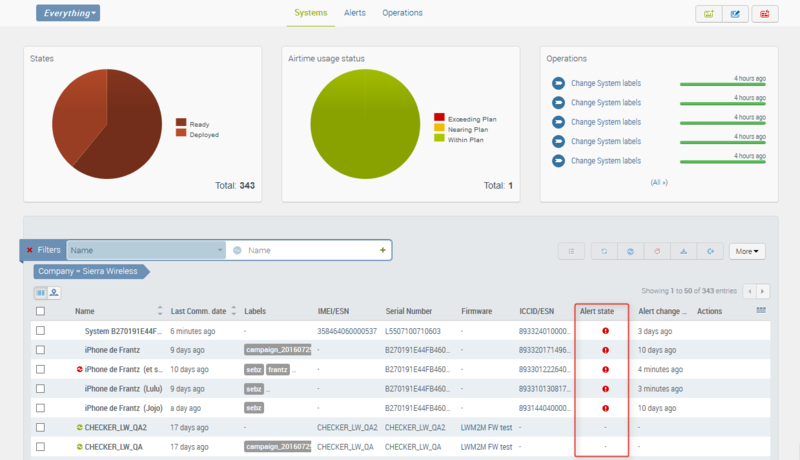 AirVantage provides a widget showing which application versions are actually deployed on your systems. Each system has got an alert state: a system can either be in alert or not in alert ‘-’. A system in alert has at least one alert rule for which an alert is currently raised on the system. As soon as the previous alert criteria is no longer met, meaning that the system goes back to expected behavior, its alert state will go back to ‘not in alert’. You can easily identify systems in alert in the grid of systems using the column “alert state” and “alert state change date”. Alert state is showing whether a system is currently in alert or not. A system in alert can be in alert due to one or more alert rules being fulfilled. Alert state change date informs you when the system became in alert, or back to normal. This column is not displayed by default, but can be added. 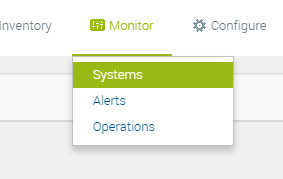 The Monitor>Alerts section is displaying all alerts currently raised on your systems. The list can be filtered by Alert rule name or target system. Alert rules are created in the Configure activity: Alert section . The loudspeaker with a red counter on the top banner displays the number of currently raised alarms on your fleet, with one different entry per system and per alert rule. It appears as soon as you are logged in AirVantage. You set the alert once, and will get noticed when the alert is raised, and then when the alert is over and the system working back the expected way. For mass configuration, templates can be created or modified starting from an existing device or from scratch. You can find how to create a new template in the Configure pages. The systems list shows the last applied Template name to each. It can be used to filter the list. Configuring your systems, you may require to specify a different value for each. This is the case for names, identifiers, passwords, or unique configuration parameter like static IP address. How to be notified of new firmware releases? How to browse your data history in a chart? How to bulk activate SIMs? How to change the configuration of my systems? How to configure a system to use ALEOS Application Framework (AAF)? How to configure the Data History Page? How to configure the communications of my system? How to export data from one or several systems? How to retrieve data from one or several systems? How to set the system name on my devices (ALEOS AVMS name) ? How to visualize the status and configuration of my systems?